At 2:00 AM this Sunday morning people in most of the United States will set their clocks ahead one hour as we begin Daylight Saving Time. Many households will also change the batteries in their smoke detectors. In Arizona, where they don’t believe in Daylight Saving Time, people mark the day by putting fresh ammunition in their handguns. The continental United States observes DST beginning on the second Sunday in March; the European Union on the last Sunday in March. 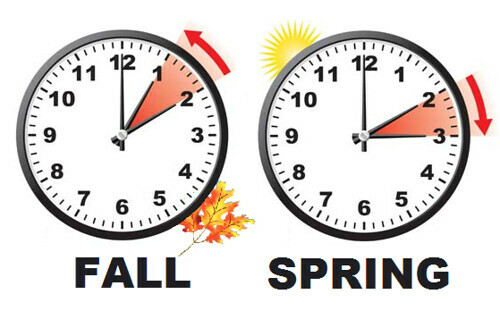 Tunisia, Bangladesh, and Fiji have joined Arizona and no longer observe Daylight Saving Time. We do not know if these counties also concur with Arizona’s denial of Climate Change, Water Fluoridation, International Law, and Evolution. Why does Arizona reject Daylight Saving Time? Perhaps the state’s many retirees can’t figure out how to change the time settings on their old VHS machines. So “Spring Ahead,” even if Spring won’t actually be here until March 20th. And your lost hour of sleep? You’ll get it back on November 5th. More on Daylight Saving Time here. And change your batteries and stuff. This entry was posted on March 11, 2017 at 8:00 pm and is filed under Uncategorized. You can follow any responses to this entry through the RSS 2.0 feed. You can leave a response, or trackback from your own site.